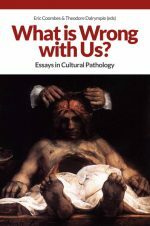 New book: What is Wrong With Us? Can any of us entirely banish from our hearts and minds grave misgivings about the condition of the culture we now inhabit? Expressions of those misgivings are mostly unheard in public forums, ignored in the dominant media, and, if noticed at all, dismissed by state-supported bureaucracies and commercial vested interests. To have any chance of gaining attention, they must resolve themselves into coherent forms. We need to clarify our perceptions of the things that trouble us, by articulating and developing our thoughts about them. That is, we are in need of serious criticism — serious criticism, aesthetic, social and political — which is notably lacking in the contemporary world, especially in places readily available to the educated non-specialist, such as the ‘quality’ weekend newspapers, and especially, perhaps, in relation to the visual arts. The pieces collected in this volume are not presented as amounting to an overall account or theory of our cultural condition. They are offered merely as examples of serious criticism, of what we need if we are to begin to think more profitably about our condition, daring, in defiance of contemporary dogmatism, to make the necessary judgements of value without which our culture will continue to disintegrate. Contributors: Michael Bussell, Eric Coombes, Theodore Dalrymple, Michael DiSanto, Mark Dooley, Laura Gascoigne, Brian Lee, David Lee, Edward Lucie-Smith, Duke Maskell, Ian Robinson, Selby Whittingham.